Gochujang is one of the beloved ingredients in Korean cooking and offers a distinctive taste. Sambal oelek is a traditional ingredient in Malaysian and Indonesian cooking that has been co-opted by Westerners as a spicier alternative to sriracha. 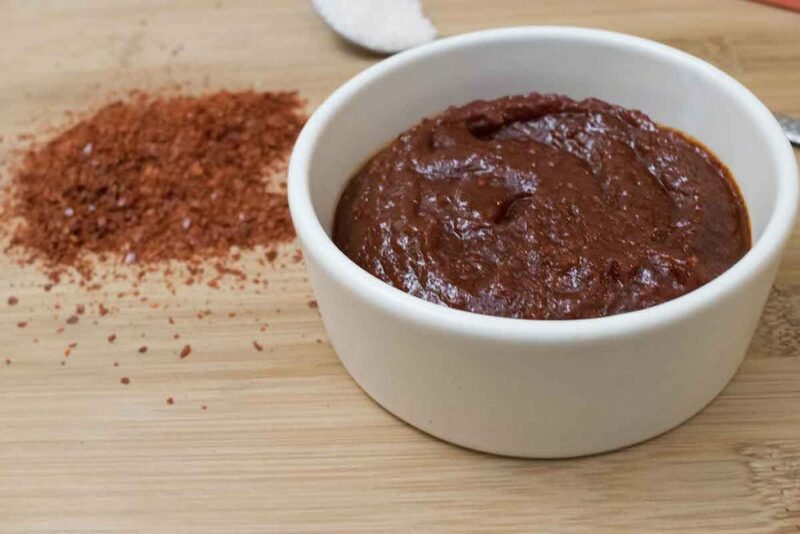 The two chili pastes have a lot in common along with a few differences. If you want to replace one with the other, focus on the way that their differences and similarities can affect your dish. Our PepperScale Showdown will help you to decide whether or not to replace one with the other. How does gochujang differ from sambal oelek? For starters, there is the matter of consistency. Gochujang is thicker than sambal oelek due to the fact that it has ingredients like starch and/or miso paste among its ingredients. 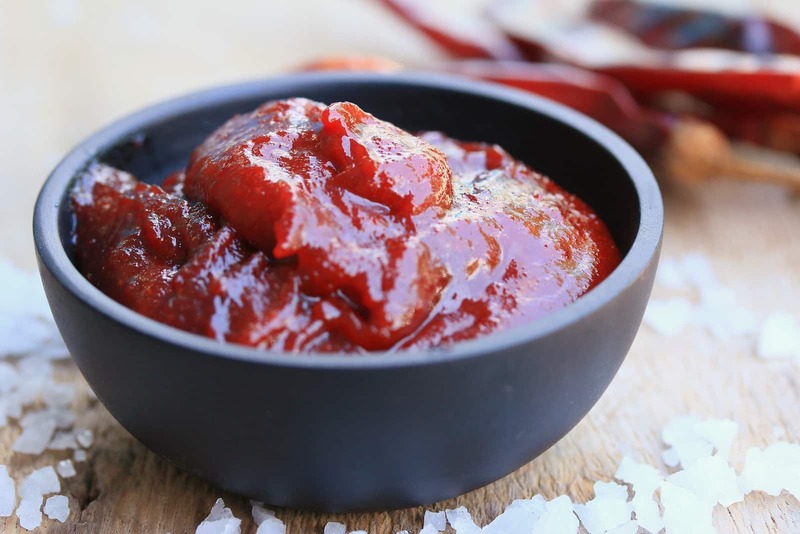 Gochujang is closer to tomato paste in terms of thickness; sambal oelek is more similar to stewed tomatoes. Sambal oelek consists mainly of chili peppers with some vinegar and salt. There are different versions and the blends may differ somewhat but differences are usually minor. While some may contain xanthan gum, starch is not one of the typical ingredients. Because raw chil peppers make up most of sambal oelek, it often contains more moisture when you compare it to gochujang. The moisture gives it a thinner consistency. The taste and smell of gochujang are different from those of sambal oelek since gochujang is fermented. 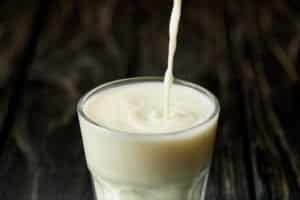 Fermentation gives it sourness and also increases the umami aspect of the flavor profile. 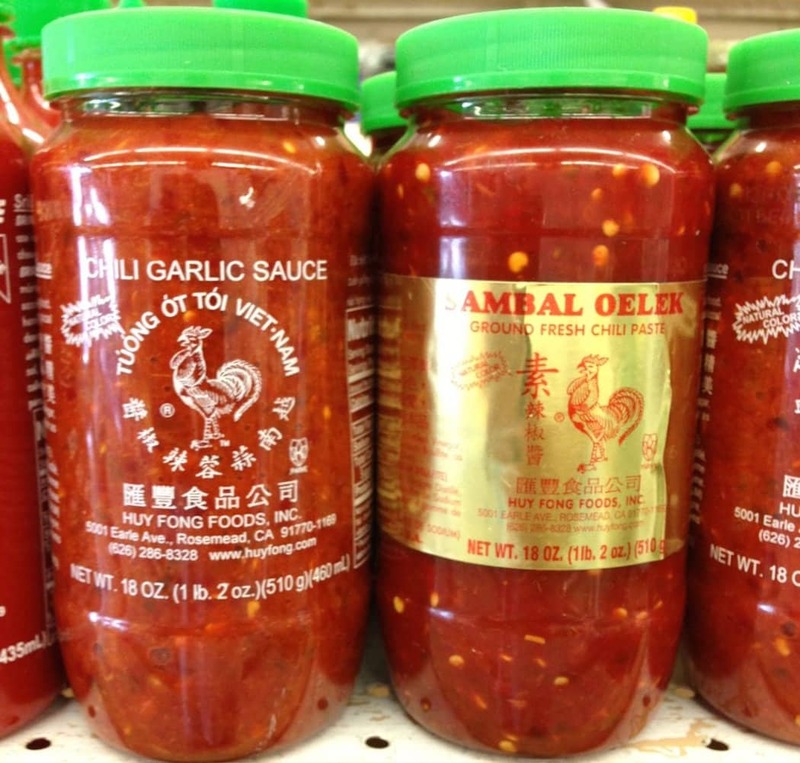 In comparison, sambal oelek has a cleaner and less acidic flavor since it is not fermented. It is also missing the strong umami note that comes from gochujang. Because gochujang relies on more than just chili peppers for its flavor, it is not quite as hot as sambal oelek. The rice, soy, and other ingredients dilute the capsaicin and mute the heat. Sambal oelek is only moderately hot at best but is still provides noticeably more heat than gochujang. Can you use gochujang as a substitute for sambal oelek and vice versa? 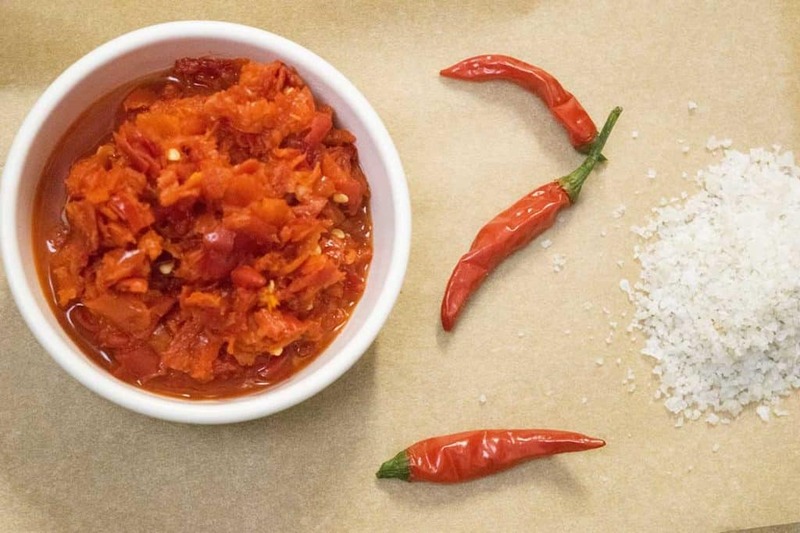 Both gochujang and sambal oelek have the same main ingredient: red chili peppers. 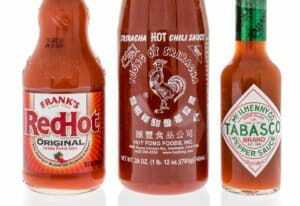 They are also meant to deliver flavor profiles that emphasize the heat from capsaicin. 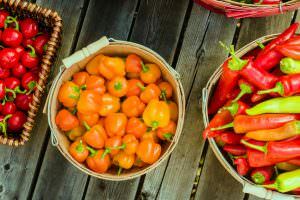 They look and taste enough alike that they can make passable substitutes for each other; however, you may have to make some adjustments to each for a substitution to work properly. For example, the fact that gochujang is thicker means that you may have to thin it out to make it a closer match for sambal oelek. Similarly, the fact that sambal oelek is thinner means that you may have to add a little starch to make it thicker. Adding some rice flour can also help to reduce some of the heat, which makes sambal oelek milder and more like gochujang. Rice flour is the best option since rice is a big part of what thickens gochujang. 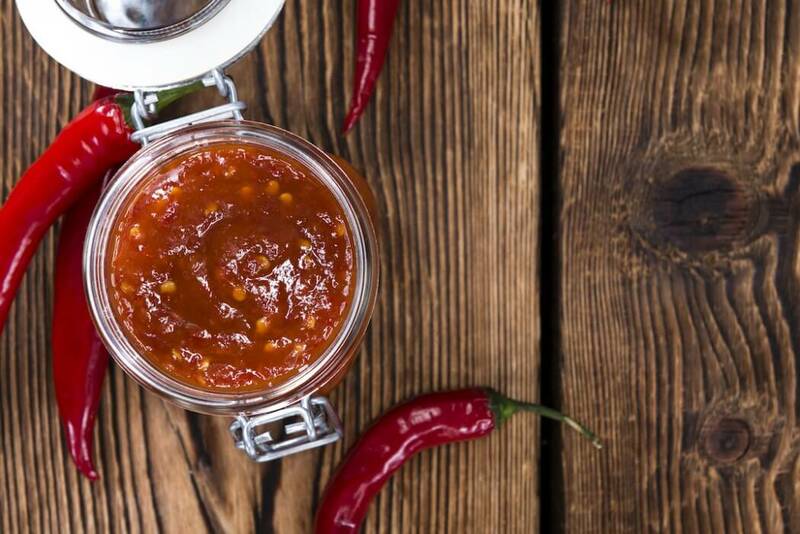 When should you use gochujang and when should you use sambal oelek? Use gochujang as a dipping sauce. Its thick consistency allows it to stick to foods. Gochujang is also the better option if you want less spiciness than you would get from sambal oelek. 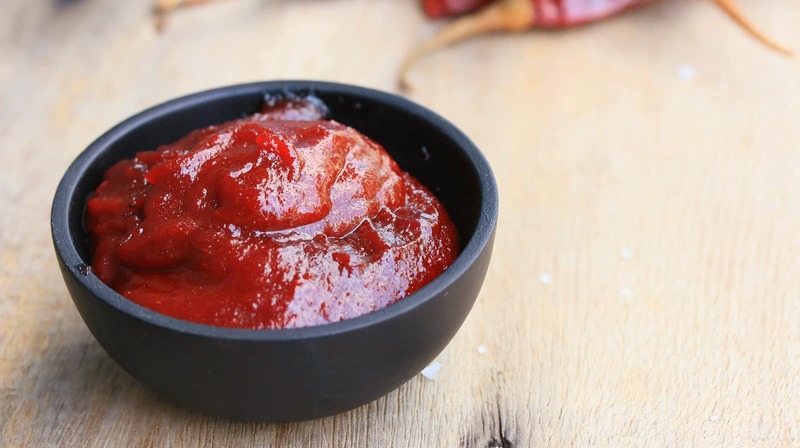 Sambal oelek’s relatively thin texture means that it is not ideal as a dipping sauce but it is great for increased moisture without any dilution of flavor. 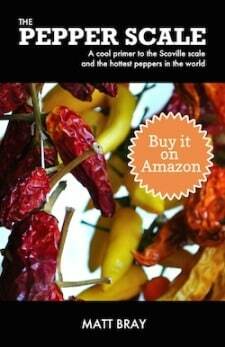 Use in sauces and dressings where you want a bright chili pepper heat and maybe a moderate acidity as well.